Gefilte fish (/ɡəˈfɪltə fɪʃ/; from Yiddish: געפֿילטע פֿיש‎, "stuffed fish") is a dish made from a poached mixture of ground deboned fish, such as carp, whitefish, or pike. It is traditionally served as an appetizer by Ashkenazi Jewish households. Although it historically consisted of a minced-fish forcemeat stuffed inside the fish skin, by the 16th century, cooks had started omitting this step and the seasoned fish is most commonly formed into patties similar to quenelles or fish balls. These are popular on Shabbat and Jewish Holidays such as Passover, although they may be consumed throughout the year. Central and Eastern Europe, United States, Israel. In Poland, gefilte fish, referred to as karp po żydowsku ("carp Jewish-style"), is a traditional dish in some Polish homes (more commonly in the northern regions near the Baltic Sea), served on Christmas Eve (for Twelve-dish supper) and on Holy Saturday. Traditionally, carp, pike, mullet, or whitefish were used to make gefilte fish, but more recently other fish with white flesh such as Nile perch have been used, and there is a pink variation using salmon. There are even vegetarian variations. In the Middle Ages, the minced-fish forcemeat was stuffed inside the intact fish skin, but by the 16th century Ashkenazic cooks had started omitting this labor intensive step. In its modern form, the seasoned fish is most commonly formed into patties similar to quenelles or fish balls. Fish fillets are ground with eggs and sometimes onion, bread or matza crumbs, and spices or salt, carrot and potato to produce a paste or dough which is then boiled in fish stock. Traditionally gefilte fish is cooked in large logs and then sliced for serving but sometimes it is cooked and served as egg-shaped patties, like quenelles. In the United Kingdom, gefilte fish is commonly fried. It is usually served cold or at room temperature. Each piece may be topped with a slice of carrot, and/or very often with a horseradish mixture called khreyn on the side. Gefilte fish is not served with carrot when one serves a spicy type of gefilte fish cooked with ground black pepper instead of carrot and potato. Due to the previous general poverty of the Jewish population in Europe and especially Eastern Europe, where the dish originated, an economical recipe for the above also may have included finely ground and soaked matza meal or bread crumbs. This form of preparation eliminated the need for picking out fish bones at the table, and "stretched" the (expensive) fish further, so that even poor, large families could enjoy fish on Shabbat. Not only is picking bones religiously prohibited on the Sabbath, but many of the common fish used in the dish, such as carp, are exceptionally bony and difficult to eat in whole form. The fish bones can then be used in making fish stock. In Polish Catholic homes, gefilte fish (Polish: karp po żydowsku) is a traditional dish to be eaten on Christmas Eve and Holy Saturday, as these are traditionally meatless feasts. This follows a pattern in which a number of Jewish dishes were also eaten on Catholic religious days in Poland. Gefilte fish may be slightly sweet or savory. Preparation of gefilte fish with sugar or black pepper is considered an indicator of whether a Jewish community was Galitzianer (with sugar) or Litvak (with pepper); the boundary separating northern from southern East Yiddish has thus been dubbed "the Gefilte Fish Line". The post-WWII method of making gefilte fish commercially takes the form of patties or balls, or utilizes a wax paper casing around a "log" of ground fish, which is then poached or baked. This product is sold in cans and glass jars, and packed in jelly made from fish broth. The sodium content is relatively high at 220–290 mg/serving. Low-salt, low-carbohydrate, low-cholesterol, and sugar-free varieties are available. The patent (‹See Tfd›US 3108882 "Method for Preparing an Edible Fish Product") for this jelly, which allowed mass-market distribution of gefilte fish, was granted on October 29, 1963, to Monroe Nash and Erich G. Freudenstein. Gefilte fish is also sold frozen in "logs". 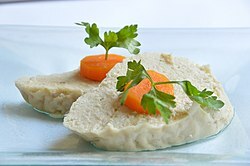 Among religiously observant Jews, gefilte fish has become a traditional Shabbat food to avoid borer, which is one of the 39 activities prohibited on Shabbat outlined in the Shulchan Aruch. Borer, literally "selection/choosing", would occur when one picks the bones out of the fish, taking "the chaff from within the food". A less common belief is that fish are not subject to ayin hara ("evil eye") because they are submerged while alive, so that a dish prepared from several fish varieties brings good luck. ^ Marks, Gil. Encyclopedia of Jewish Food. Houghton Mifflin. ^ "Gefilte Fish, Fried to Perfection". The Forward. Retrieved 2018-07-24. ^ a b Johnowitz, Eva. Chapter 4, "Flavors of Memory", in Culinary Tourism, Lucy M. Long (ed.) University Press of Kentucky, 2013. ^ Rabbi Zushe Blech: "The Fortunes of a Fish", Kashrut.com website. Accessed March 30, 2006. ^ Gil Marks: "Something's fishy in the State of Israel" Archived 2006-03-29 at the Wayback Machine, Orthodox Union website. Accessed March 30, 2006. Barbara Kirshenblatt-Gimblett: "Food and Drink". In: The YIVO Encyclopedia of Jews in Eastern Europe, Yale University Press, New Haven 2008, p. 534, ISBN 978-0-300-11903-9. Haym Soloveitchik: "Rupture and Reconstruction. The Transformation of Contemporary Orthodoxy". In: Tradition, Vol. 28, No. 4 (Summer 1994).